Assistance League Greater Collin County wishes to thank JCPenney for their generous gift! The money will be put to good use serving those in need. Representatives of JCPenney presented a $3,000 check to Assistance League at the January Chapter Meeting. 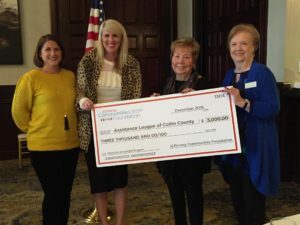 JCPenney representatives Josette Colver, Director Merchandise Marketing, and Sage McEuin, Senior Styling Director, presented the check to chapter members Gale Duff-Bloom, former JCPenney executive and Charlotte Grimm, Grants Committee Chair.